These changes are likely to help Republicans and are already being blasted by Democratic Party advocacy groups, who have no doubt been preparing for this for a long time. It’s unlikely that their efforts will have any effect, however. North Carolina currently has some of the most liberal voting laws in the country, with an early voting period that some would say is excessively long. 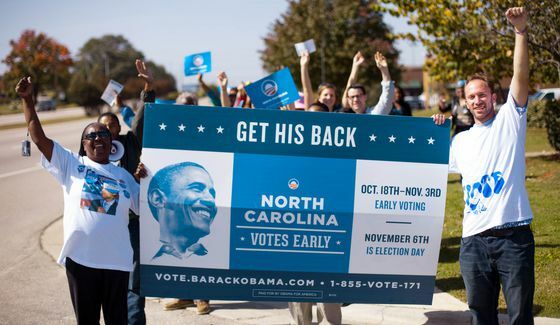 This long early voting period was taken advantage of by the Obama campaign in both 2008 and 2012, helping them bring in as many of their voters as possible. The Sunday early voting period was notable for the “Souls to the Polls” campaign, where African Americans were directed to march to the polls right after church to vote a straight Democratic ticket. These changes will help Republicans and hurt Democrats, who often rely on low-information, sporadic voters who often need an extending voting period and very liberal election laws in order to make voting as convenient as humanly possible. Republicans probably wish these laws were in place last year. Without the massive early voting window, it’s unlikely that the Obama campaign would have put so many resources into the state in 2012. Republicans should pass the bill as quickly as possible and shouldn’t waste time on trying to justify some of the changes, though reasonable arguments could be made for each of them. Nor should the popularity of early voting deter them. There’s a big difference between an issue with low support but high intensity of support, and an issue with high support but low intensity of support. Early voting decisively belongs to the latter case. Nonetheless, a recent poll conducted by PPP on behalf of liberal advocacy group ProgressNC finds overwhelming support (78%) for early voting. The most interesting finding of that poll, however, is that “limited” Sunday early voting is supported only 53%-43%. Clearly, there’s a large minority of NC voters who are uncomfortable with voting on the Sabbath. Pass the bill – ram it through – get it done. The less time spent talking about it, the better. In the weeks and months that follow, the matter will be forgotten entirely. Of the reforms, perhaps the most interest will be the changes to how judicial elections are conducted; many theorize that returning to partisan judicial elections will help Republican candidates – the theory goes that voters like Republican judges because they’re tough on crime. More on this later. While these changes will likely result in a more Republican-friendly electorate (at the margins), they are not very innovative. If conservatives are bold enough, they should push for a civics test as a requirement for voter registration, the same given to those who wants to be citizens of the United States. Perhaps not in a purple state like North Carolina. But a blood-red state like Idaho might be a good testing ground for such a proposal.